Documentation indicates that this track was recorded in New York. Was it recorded in New York City proper? It looks like it. 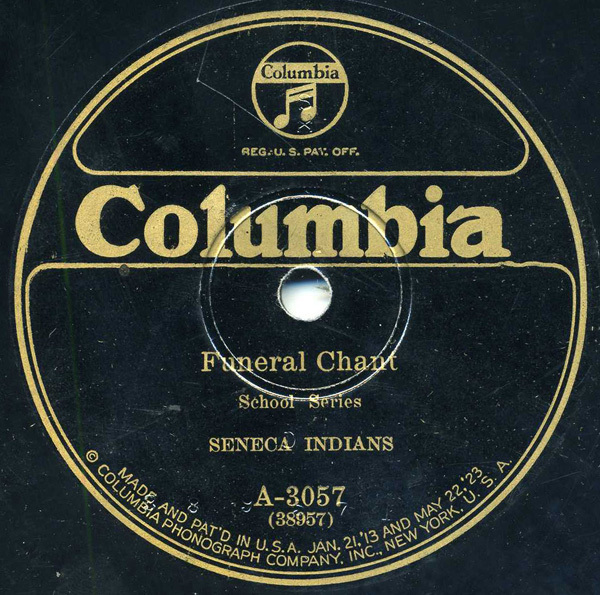 I scoured New York City papers from that time period and there was no definitive mention of Seneca Indians in town for an event in the summer of ’13. However, in May of 1913, there was an announcement in the New York Times of a production of “Hiawatha” performed from June 9 to July 5th of that year by the “Indian Players from the Government reservation on Lake Erie” on a theatre on an estate in the Bronx, with the whole event being sponsored by the Women’s Municipal League. The “government reservation” referred to in the article is almost certainly Cattaraugus, a Seneca reservation on the lake established in 1784 – and most probably these are the same Seneca Indians who made this recording. I will be away for the next three weekends, detoxing from the city and hopefully spending most of my time in a contemplative state. However, Excavated Shellac will continue on schedule! So, keep checking back. We aim to please. Very cool posting…just the kind of tracks I scour the music blogosphere looking for. Thank you. You can be sure I will spread this one around the area. I live in Naples NY, just about 5 miles south from Bear Hill, the sacred site of the Seneca’s creation myth and about 25 miles south of Gonandogan near Victor, NY where the White Lady of Peace firwst began the process of establishing the oldest permanent democracy in the world, the Iroquois League, going on 600+ years now. Thanks, Duncan, for checking it out!